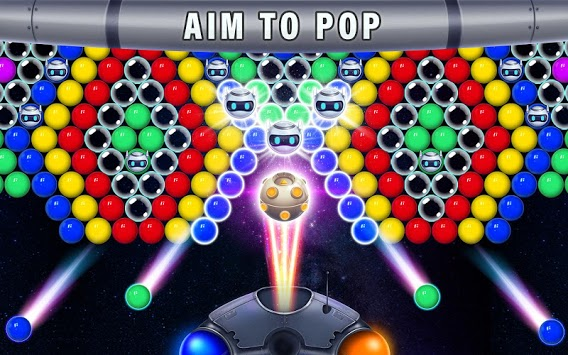 Robot Rush Bubble is a bubble shooter game bursting with adventure, excitement, and prizes. This rescue game is set in the cosmos, and you must save the bots trapped inside bubbles by shooting the balls, helping your robots friends go free. As you battle an epic space adventure in this fun puzzle, you’ll face new challenges. 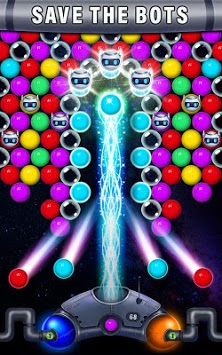 Use skillful tactics and feel the rush as more balls burst across the screen at every moment! Join a Galactic Rescue Mission! • The more bubbles you pop at once, the bigger the blast! Collect cosmic prizes and discover awesome surprises that are out of this world! ★ Addictive: Blasting bubbles is super addicting, you’ll get hooked as no board game has ever pulled you before! 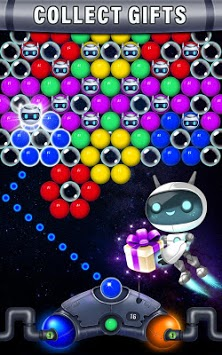 ★ New offline game: Robot Rush Bubble is a no internet game. You can play offline because no WiFi is needed to connect. Play wherever and whenever you want! ★ Challenging your brain to defend the galaxy: This rescue game has thousands of levels to journey through. You’ll have to put your brain to the test as you form a strategy to pop balls. Think fast because a new bubble drops every second! ★ Lots of thrilling puzzles: Each one is an amazing experience, so give it a shot! It’s a mad dash as you attempt to hit combos of zany popping fun in this cool offline game! Download today to your Android device and join the fun!